4-Word Review: His love isn’t reciprocated. 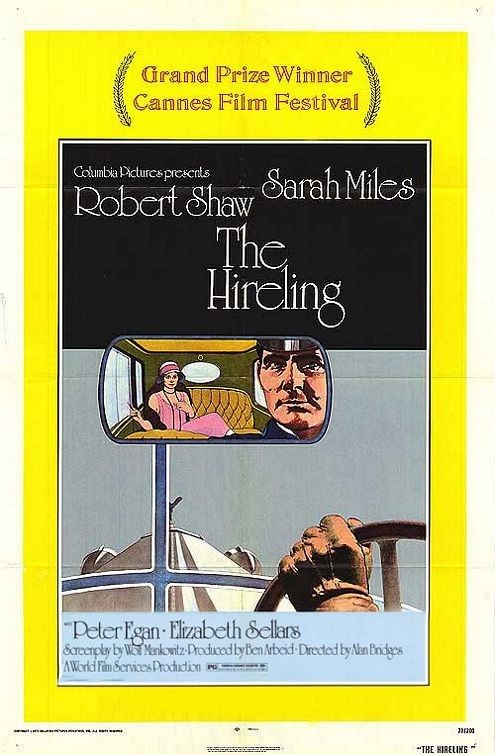 Based on the L.P. Hartley novel the film examines the unusual relationship between a rich English widow named Lady Franklin (Sarah Miles) and her chauffeur Steven Ledbetter (Robert Shaw). The setting is just after the First World War and Lady Franklin has suffered a nervous breakdown after the untimely death of her husband. Steven drives her from place-to-place and helps her out of her depression while also forming a strong attachment to her. Once she recuperates she no longer calls upon his services as much, which hurts him. She then forms a relationship with the much younger Hugh Cantrip (Peter Egan). His personality is the complete opposite of Steven’s and when Steven finds out that Hugh is still seeing another woman on the side it angers him. When he goes to Lady Franklin to inform her of this as well as profess his love for her things do not go well and soon spirals out-of-control. The film is exquisitely photographed by director Alan Bridges with a haunting score by Marc Wilkinson that is excellent. The period atmosphere is perfect and the slow pace not only reflects that era, but the book to which it is based. Some may be put off by the pace as it is for the most part quite talky although the last half-hour has more action and final showdown is quite intense. The element I really liked about the film are the brief cutaways showing people listening in to other’s conversations and people always being careful what they say and great concern with always playing their ‘proper role’ in society. It really helps build a cloistered feeling for the viewer and gives them a better understanding to the meltdown that occurs at the end. Miles gives another great performance and she essentially plays two characters here with the fragile, wide-eyed woman at the beginning and the more confident, emotionally distant person that she turns into at the end. Shaw is excellent as always. It is almost amazing to see how someone with such a strong personality as his could get hidden underneath the rather bland and proper character that he portrays at the beginning, but he comes through full-force at the end, which is chilling and terrifying. The film makes some great statements about the inequities of a rigid social caste system as well as the unrealistic, rigid demands that were placed on people especially in past eras that did not completely take into account the human being underneath or their natural emotions. It is also a great testament to the loneliness of unrequited love, which is sadly a perennial element of the human experience. Although the film stays faithful to the novel the ending has been changed, which may or may not go over well with some viewers. 4-Word Review: He needs a job. Ginger Coffey (Robert Shaw) is a middle-aged man living in Montreal whose dreams and ambitions far outweigh his grim predicament. He moves from one low paying job to another convinced that his lot in life will improve. 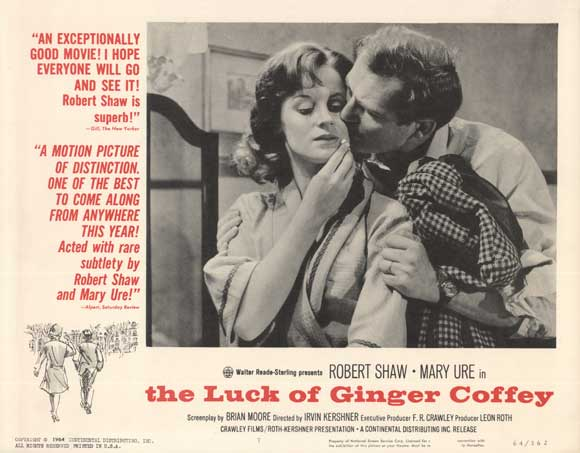 His wife Vera (Mary Ure) decides to leave him and Ginger tries to win her back while juggling two jobs and hoping to get a promotion in one that never seems to come. As a vivid look at the daily lives of the everyday working class this film hits a solid bullseye. The conversations between the co-workers and the monotonous and sometimes demeaning job interview process and Ginger’s on-going arguments with his wife and daughter are all true to form. There is no pretension and director Irvin Kershner keeps everything at a bare-bones minimum giving it almost a documentary style and making the viewer feel immersed in the bleak environment. The outdoor shots of the city are unexciting and cinematically unappealing, but help reflect the grim level. Watching Ginger get kicked out of his apartment and have to carry what is left of his belongings and then place them on the outside sidewalk while he goes in to visit his daughter in her school is quietly powerful. Robert Shaw is excellent. This is a man who had by all accounts had a very dominating and proud personality in real-life and usually played characters with the same traits, so seeing him play against type and succeed is interesting. What is really effective is that he makes the character very human and likable despite his constant goof-ups, which keeps the viewer compelled to his situation. Ure, who at the time was married to Shaw in real-life, gives an equally outstanding performance. Her perplexed facial expressions are perfect and the fact that we see her character grow and become more confident is good. I also must mention Liam Redmond as Ginger’s cantankerous boss, who is nicknamed by his employees as ‘Hitler’. Ginger’s rushed job interview that he has with him is one of the film’s highpoints as is the moment when Ginger dashes away from him when he is caught making a personal phone call. The only real complaint I have with the film is the ending, which is for the most part non-existent. I have seen vague wide-open endings in my movie viewing lifetime, but this thing is a cop-out and really boring one at that. I think when a viewer has spent nearly two hours empathizing with his difficult and precarious situation that they deserve some sort of finality, or at least a hint of what became of him and whether he ever did find that ‘luck’ that he was so convinced was out there. 4-Word Review: Tear up the newspaper. 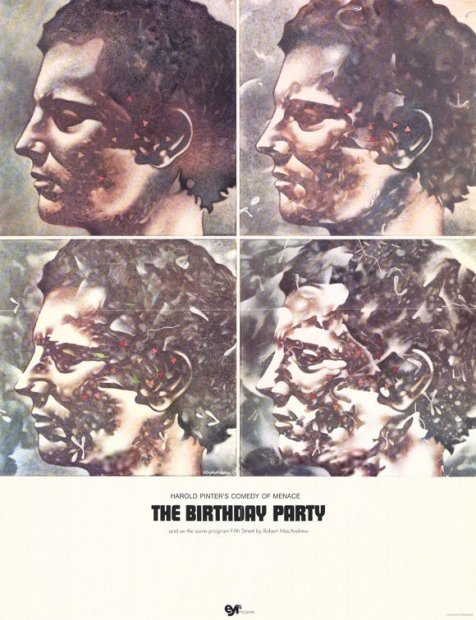 Since tomorrow will be my birthday I wanted to come up with a film that had birthdays as its theme and found this bizarre but fascinating obscurity. It is the story based on the play by Harold Pinter of Stanley Webber (Robert Shaw) a mysterious and private man who takes up lodging in a rundown British seaside house. He rents an upstairs room from Mr. and Mrs. Bowles (Moultrie Kelsall, Dandy Nichols) who are quite odd themselves. 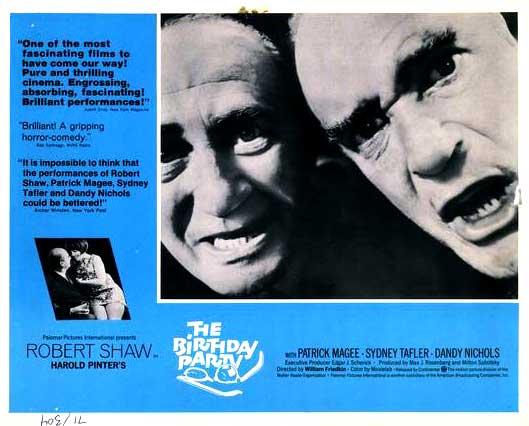 One day two men dressed in black suits (Patrick Magee, Sydney Tafler) come to pay Stanley a visit. They know something about Stanley’s past and their presence frightens him to the extent that it causes him to have a nervous breakdown. On the surface this film shouldn’t work. There is an excessive amount of talking with dialogue that doesn’t say much and at times seems absurd. The set is drab and dirty with the camera seemingly locked down inside of it. There is never any explanation about Stanley’s past or what he is running from nor who the men are or what they know about him. The ending is elusive and the viewer will go away feeling more confused than they did at the start. However, it is these ingredients that make the film so thoroughly intriguing. The seemingly banal dialogue is simply a façade for underlying thoughts and feelings. What Stanley is trying to run from is unimportant because it is really not about him at all and is instead more about ourselves, human nature and the quandary of our existence. It’s an examination of people’s futile attempts at trying to escape from who they are only to have society and life catch up with them. The set could be a metaphor for the inside of Stanley’s head. The grimy and decayed place symbolizes his decayed soul and the men in black suits are his conscience coming to haunt him. Once you adjust to the eccentric narrative it then becomes a fantastic film for observing subtitles and nuance. Director William Friedkin shows a keenness for detail not only visually, but with the sound as well. The way the Magee character tears up a newspaper and the sound used for it could actually unnerve some viewers. Stanley’s meltdown scene is very unique and overall the direction is superb for such difficult material. This movie was years ahead of its time, but for some it may be off-putting. However, it should be enjoyed by those who crave the avant-garde. It is also a rare chance to the see the normally strong-willed Shaw playing a very weak and vulnerable character. Nichols is also a stand-out playing an Edith Bunker type with a perverse streak lying just beneath the surface.